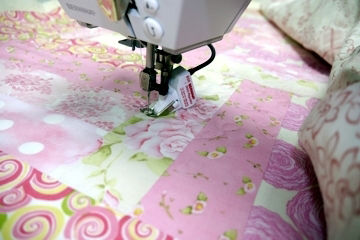 It’s just a doll quilt…or is it? 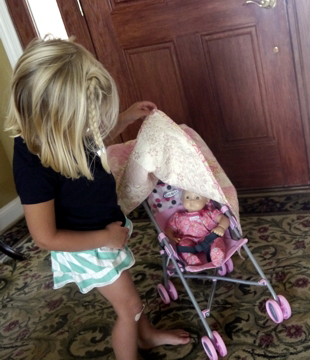 There’s a special little girl named Kendall, who loves a special doll named Anna. 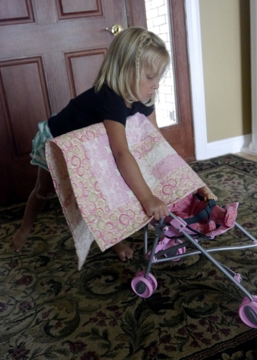 So this grandma thought it would be fun to make a doll quilt with this precious three year old. What I thought was just a quick weekend project turned into so much more. 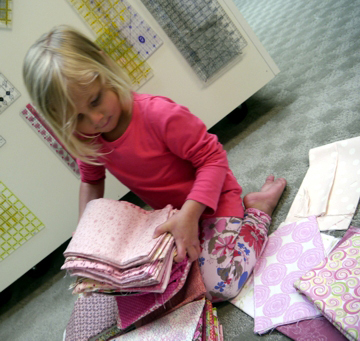 Grandma has quite a stash of fabric, so to narrow down the choices, Kendall told me that she wanted a pink quilt. So out came a stack of pink. 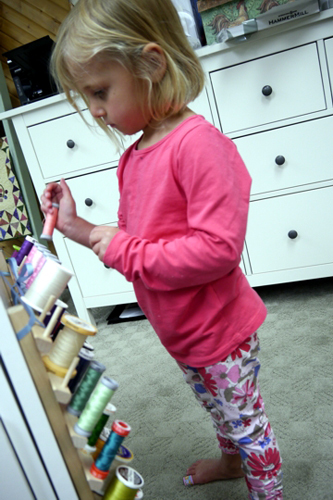 It was fun to watch her browse thru the fabric, picking out the ones that she liked best. Were these the fabrics I would have chosen? Well, no. But I told myself, “It’s just a doll quilt.” Did I try to encourage other choices? Well, yes. But she definitely has a mind of her own. Oh, what does it matter? It’s just a doll quilt, right? It was quite fun for me to see her excitement in handling the fabric and I just had to giggle as she hugged her final choices. She may just end up liking fabric as much as I do! Off to the cutting table we went. After perching her on a stool I told her about the tools we would be using. 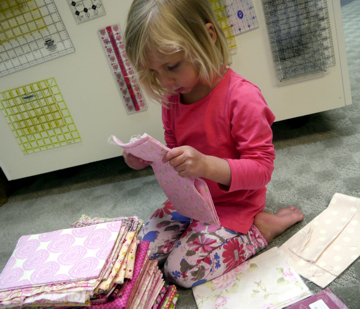 She listened intently and then told me in which order she wanted to cut the fabric. She carefully handed them to Grandpa as she told him he had to be careful of the rotary cutter. She’s a good listener! The strips were cut and it was time to pick out the thread. Who knew that could be such a big decision? But after talking about colors for awhile she decided pink would be best. “Whew,” I thought, “Right choice.” But the color wouldn’t have mattered because, after all, it is just a doll quilt, right? Next came a “lesson” on seams and the sewing machine. 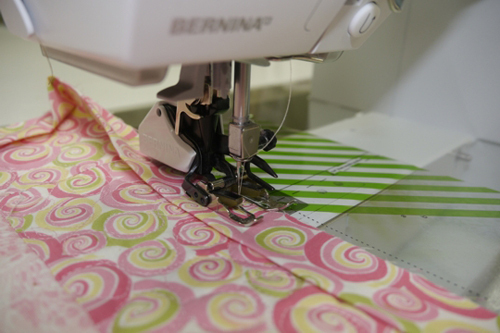 Of course, I told her she’d only ever want to sew on a BERNINA! With the speed turned way down on my 550 QE we set out to sew. She really is such a good listener! As she sat on my lap, she pushed the Start/Stop button whenever I told her. Hmmm…. Some of these seams aren’t very straight. Oh well, it’s just a doll quilt. With the blocks sewn it was time to arrange them. Some went this way, some that. Okay, at this point, even though it’s a doll quilt, I turned some of the blocks when she wasn’t looking. 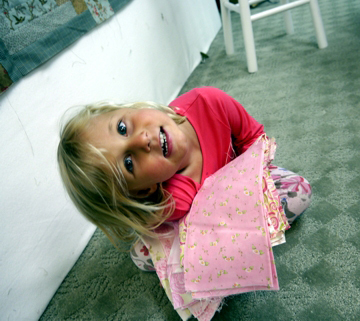 But she found her favorite fabric in the mix and was a happy little girl. While I was sewing the blocks together, she was getting bored, as most three year olds do. So I got down my button bowl. I shared with her how I used to play with my grandma’s buttons. Grandpa told her the games he played with buttons at his grandma’s house, too. Not much progress was being made on the quilt. But, it’s just a doll quilt. That evening, alone in my sewing studio, I sewed on the borders. In the quietness my heart was happy with our little project. She did a good job picking everything out and what fun it was for me. I hoped she had had fun too. The next day the backing fabric was chosen and we went about the quilting. 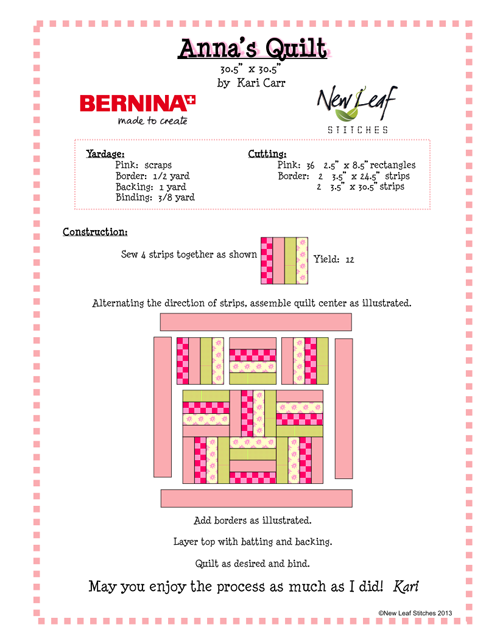 Thank goodness for the BERNINA Stitch Regulator, because free-motion quilting is not my forte. But even in the imperfect stitching (it’s just a doll quilt, for cryin’ out loud) I showed her the hearts I had scattered about. I wanted her to know that when she looked at them she would know I loved her. The day sped by quickly and the quilt wasn’t done. A few days later, as I was adding the binding (I always use my walking foot for this), it was such a pleasure to think about my dear, sweet one. I was told that Anna really likes the quilt, too. And she has such a good “mommy” that takes care of her. So tenderly Anna was put down on the quilt and wrapped just right. Rocking, patting, singing to her baby. Yes, I thought, Kendall is going to grow up to be a kind and caring person. Time to move. 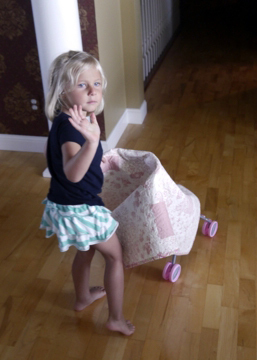 We put Anna in her stroller and I was just going to throw the quilt over her. But, someone (guess who?) basically scolded me and showed me how to properly cover a baby in a stroller. Did I mention she has a mind of her own? Through her imaginative play we went to a park, went shopping, and, of course, stopped to see if Anna was sleeping. This is the most wonderful story and the most magical memories that you both will have forever. How lucky you are. You have been blessed with that beautiful child. This is great. 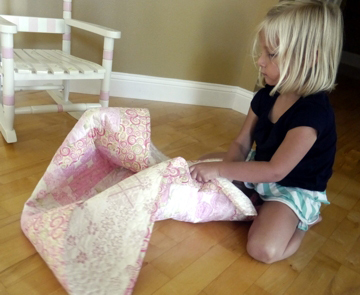 I didn’t make a doll quilt for my granddaughter, but we have made several projects together. Your story brought back those wonderful memories of the time with her. She is now nearly 14 and I hope she remembers those good times & love we shared, as clearly as I do. And I hope I have instilled the love of fabric & the importance of creating something, that I have. What a great story. 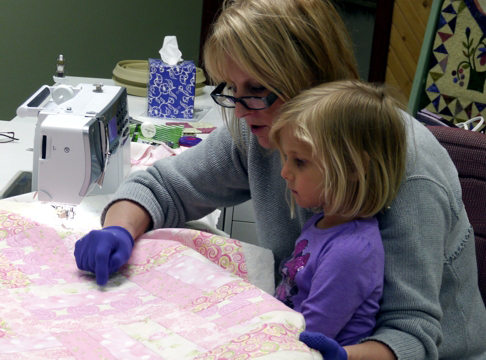 I have taught my sons to quilt ( they are now in their 30’s) I have taught my sisters girls to quilt and out of all of the , one became a quilter. So she won my Bernina 200 when I got my 830. It went to a great home and is used every day and my soon move over seas( we hope the big question comes at Christmas and before he is deployed). 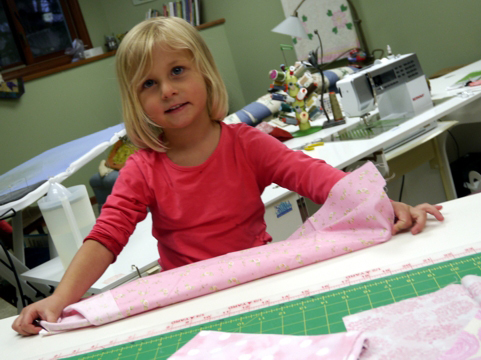 But all this to say it is great to teach kids young and now I have a grand daughter who is one and she will learn how wonderful fabric is and how great it is to know how to sew quilts for your dolls is. But she will start on a featherweight . Only goes one way lol. 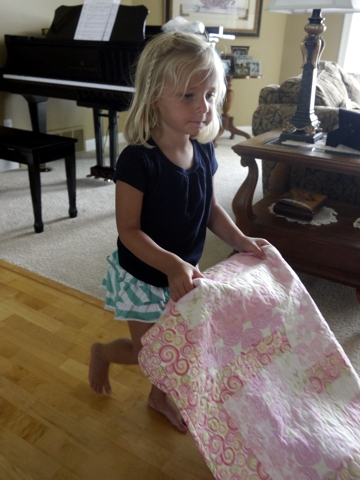 Thank you again for the great story and I will save the directions to make the quilt when Rylee is 3 , she just turned1 in October. Your story was wonderful and it reminded me so much about what I experienced with 2 of my granddaughters (Aubrey-6 and Addison-4) this past summer. Upon arriving at my house, they walked in the door saying they wanted to make a dress for their dolls that they brought with them. The oldest one even brought one of the pieces of fabric that I had given her previously. The time we spent (all day) was such a wonderful learning and sharing experience for both of them as well as me. They were so patient when it was the other one’s time to be at the sewing machine. I loved it and so did they! I would advise every grandmother out there to set aside this kind of time with the little girls in their lives.